Following are some items that were mentioned during the 29 November 2012 Fieldstone Common interview with Prof. Kenneth A. Lockridge, author of A New England Town: The First Hundred Years. 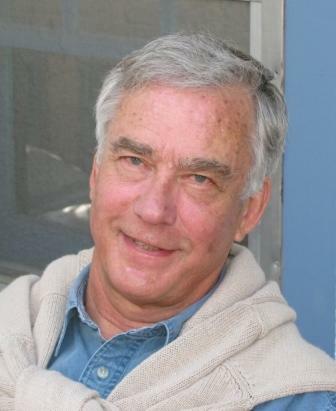 You can learn more about Ken Lockridge from his staff page in the history department at the University of Montana. A New England Town: The First Hundred Years was published in 1970 and is still available through various book sellers such as Amazon.com. Four Generations: Population Land, and Family in Colonial Andover, Massachusetts by Philip J. Greven Jr. These books should all be readily available from your local library network. A panel discussing the importance of these books was held at the 2010 American History Association conference in San Diego. The panelists included all four authors above. A synopsis of that discussion was written by attendee Eric Miller. Ken talked about Gustavus Hesselius and his accurate and sympathetic paintings of Native Americans. The specific article he was referring to was “Overcoming Nausea: The Brothers Hesselius and the American Mystery.” This article is available on the Common-place website. Color images of the paintings are available in that article. Family Patterns in Nineteenth Century Swedenwith Bobbi Low and Alice Clarke, published by the Demographic Database, Umeå, Sweden, 1992. “Toward an Ecological Demography,” with B. Low and A. Clarke, Population and Development Review, 18, 1 (March 1992), 1-32. The Fertility Transition in Sweden: The Evidence of Smaller Geographic Units, 1805-1890. Demographic Database, Umeå, Sweden, 1983. A summary version was printed in the Proceedings of the Nordic Demographic Conference, Sweden, 1983. Translation of Åke Sandström, A War Within the Civil War: Colonel Oscar Malmborg and the Men of the 55th Illinois Infantry. The most recent episode of Fieldstone Common featuring Professor Ken Lockridge author of the book A New England Town: The First Hundred Years is now available as a podcast. Click here to view the show notes with detailed info on the episode. In 1970 Professor Ken Lockridge published a book called A New England Town: The First Hundred Years. This book established an innovative way to examine and interpret developing 17th century New England towns. The book allowed us to look at these early colonists as people rather than simply names and dates. In addition, works published at the same time by his colleagues Demos, Greven and Zuckerman helped set off a new interest in the history of early America. Join Marian Pierre-Louis, host of Fieldstone Common, as she discusses the start of Professor Lockridge’s career with A New England Town and then progresses through 40 years of his fascinating historical projects. Following are some notes on items that were mentioned during the 13 September 2012 interview with Meaghan Siekman, curator of the Fairbanks House (the oldest timber-frame house in America). 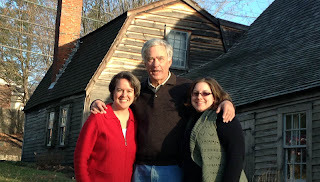 You can learn more about the Fairbanks House at their website and Facebook page. Next year’s Fairbanks Family Reunion will be held August 10, 2013. The dendrochronology tests performed on core samples from beams in the Fairbanks House were conducted by the Oxford Dendrochronology Labratory in Oxford, England. 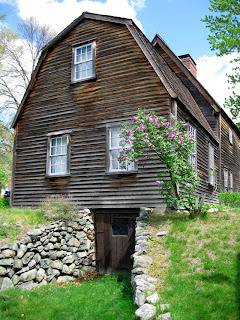 Their website provides information about dendrochronology tests at the Fairbanks House and many other historic New England homes. Travis Parno is the archeologist who conducted the archeological digs at the Fairbanks House in 2009 and 2010. The Genealogy of the Fairbanks Family in America, 1633-1897 by Lorenzo Sayle Fairbanks is available online in digital format. 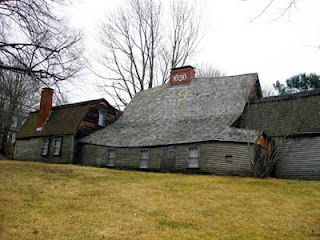 The best published source for information about the Fairbanks House is The Fairbanks House: A History of the Oldest Timber-Frame Building in New England by Abbott Lowell Cummings. Two copies of the book that were given away as door prizes were generously donated by its publisher, the New England Historic Genealogical Society. The Fairbanks House offers tours Tuesday through Saturday, 10:00am-4:00pm and Sundays 1:00-4:00pm, May through October each year. Special 90-minute tours are being given by the curator, Meaghan Siekman. Contact the Fairbanks House for information on dates and times or call 781-326-1170. The most recent episode of Fieldstone Common featuring curator Meaghan Siekman talking about the Fairbanks House (the oldest timber-frame house in America) is now available for download as a podcast. The podcast can played through the computer using your default media player or downloaded to iTunes (just click the iTunes button on the main page). The Door Prizes are Ready!! This week Fieldstone Common has some extra special door prizes. 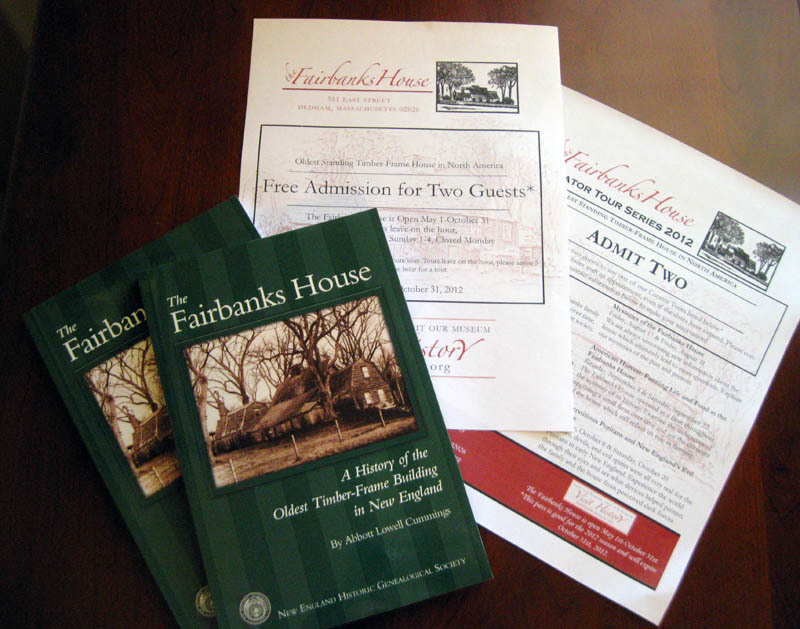 Marian Pierre-Louis will be giving away two pairs of free tickets to tour the Fairbanks House in Dedham, Massachusetts. One pair of tickets is for the general 60-minute Fairbanks House tour (a $24 value). The other is a pair of tickets for the special 90-minute curator tours of the house (a $40 value). These door prizes will be of most value to Fieldstone Common listeners who live within driving distance of the Fairbanks House. The free tours are provided courtesy of the Fairbanks House. 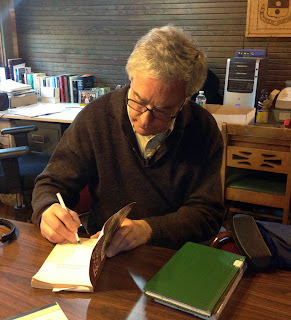 Recognizing that many listeners are spread out across the United States we are also offering two copies of the book The Fairbanks House: A History of the Oldest Timber-Frame Building in New England by premier architectural historian Abbott Lowell Cummings. These books are provided courtesy of the New England Historic Genealogical Society. 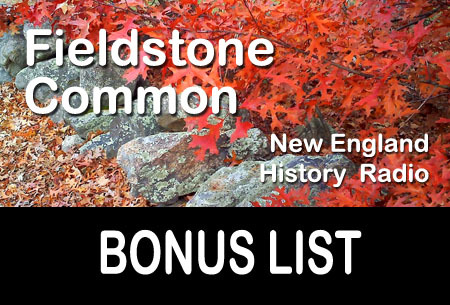 Be sure to set a reminder for Fieldstone Common in you calendar and get ready at 1pm EST today to hear some great discussion with curator Meaghan Siekman and win some door prizes. The Fairbanks House in Dedham, Massachusetts, built c. 1637 is the oldest timber-frame house in America. It was unique for being owned and lived-in by 8 generations of the Fairbanks family. No other family ever lived in this house. But this house is not just the best preserved 17th century home, it also demonstrates the changes that have occurred in New England and American history over 372 years. On Thursday, September 13, 2012 Fieldstone Common host, Marian Pierre-Louis, will speak with Fairbanks House curator, Meaghan Siekham. 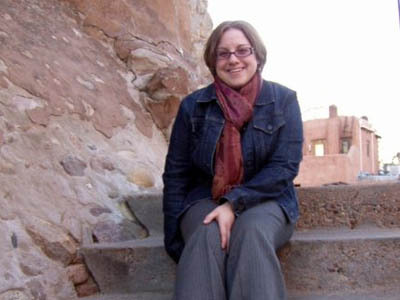 Meaghan will explore many topics that bring the history of the Fairbanks House alive including the mysteries of the house, Puritan Superstitions, the lives of women at the house and much more. 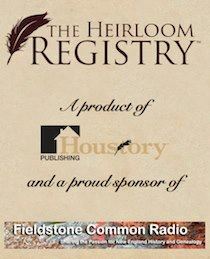 Tune in live to be eligible to win one of two copies of the book The Fairbanks House by Abbott Lowell Cummings generously donated by the New England Historic Genealogical Society. We’ll also be giving out two pairs of tickets to tour the Fairbanks House. Fieldstone Common is live radio streamed via the internet. All episodes are recorded and made available afterward as a podcast.